Steve Keen’s an economist worth listening to. In this video he explains how to sort the financial mess out. He thinks we should pay off private debt for people and companies, take the banks under government control and launch a financial system which made money available for business investment, not for gambling on house prices or stock markets. It’d be difficult to untangle the different sorts of lending because they are so interconnected. Banks lend to each other using complex conconctions of debt as well as lending to companies and individuals. But the untangling’s got to be attempted because we have to distinguish between good lending, which finances productive investments, and bad lending, which is used to bet on rising asset prices. The build-up of a huge pile of bad debt got us into the crisis. Another vital — and basic — distinction, which even the interviewer in the video appears to miss, is between private and public lending. In Britain private sector debt is about 450% of GDP, over triple what it was in 1987. Government debt is about 150%, having roughly doubled because of the bank bailout. Even after the bailout private debt is like Ben Nevis to private debt’s Carnethy. 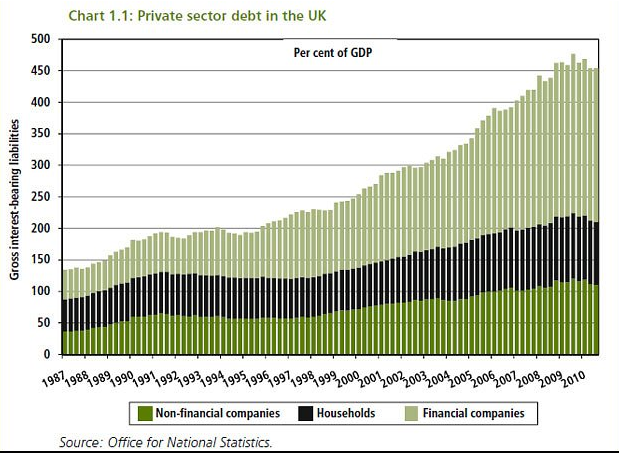 * And as shown by this graph from Anne Pettifor of PRIME, within the private sector financial companies accumulated by far the most debt over the past two decades. Public borrowing has also jumped as a proportion of economic output in the last few years, but that’s partly because the private sector had so overextended itself that it slashed lending for investment, cutting economic growth. The British government is wrong to lay all the blame for the crisis on a bloated state. UK Chancellor George Osborne is worsening the crisis because he’s shrinking spending at the very time when the economy needs more help; and with interest rates very low he could cheaply borrow more to kickstart the economy. Writing off debt would be a radical measure, not least because it’d be technically tricky. How to distinguish between good and bad lending? It’d be important to devise a way of requiring people and firms to pay off debt rather than spending the windfall and running up a new credit-card bill. Any new financial system would need some way of preventing future financial or property gambling. I think there should be a ban or punitive tax on house sales within five years of purchase, for example, like in some Swiss Cantons. People would also grumble that a debt jubilee would punish the sensible and reward the reckless. We’d have to devise some systematic way of distinguishing between worthy and unworthy debtors, probably related to income. But at the moment we’re rewarding the reckless — the banks — by an order of magnitude. And as Keen points out the consequences of not paying down the debt could be catastrophic: years of slow economic growth, sustained high unemployment and possibly political backlash from unemployed youth. Lastly, a note about credibility. Keen didn’t just pluck his arguments from thin air. Underlying his proposal is an important economic argument about how money’s created. Keen thinks that banks create money by lending. That free credit card thrust at you through the letterbox is a form of money-printing. Most mainstream economists, on the other hand, believe that banks just mediate between savers and borrowers, receiving deposits from people and lending the money on to companies and taking a cut in the process. For Keen, banks are money machines. For most economists, they’re simply lubricants in the capitalist machine. I think Keen’s right. The mainstream is a bit naive — it’s not as bad as imagining that cash grows on trees; maybe a bit more like pretending that money is found behind a bush. The Bank of England is full of mainstream thinkers who’ve got a mistaken idea about how money is made. That’s why their main policy for digging us out of the crisis — quantitative easing — is the wrong medicine. If you directly create cash in the current climate and hand it to the banks, they’ll hoard it rather than lend it to companies. If you comprehend that money is created in the very act of lending to the private sector, then you’re a lot further to understanding what’s really going on and you can design appropriate policies, ones that downsize silly lending, restore confidence and get the economy moving again. Keen draws on Keynes, who has come back into vogue in the last few years (all the best economists have K, E and N in their surnames. What did Barbie’s other half do again?) Another of Keen’s heroes is Hyman Minsky, also in favour since the crisis. Both of these greats were renowned for being realistic about economics and not theorising as if they inhabited some alien planet. They struck at the roots of a problem without bothering much about convention. For me that’s what makes a good economist. Radical problems need radical solutions.